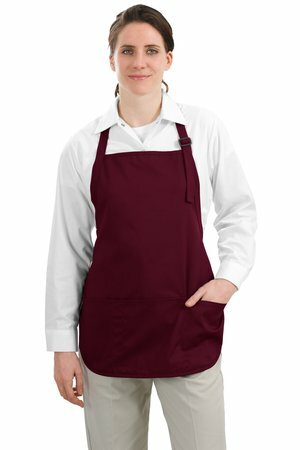 This versatile apron has a Teflon ® finish for added stain protection. | 100% cotton twill with Teflon finish for added stain protection Three pouch pockets, pen pocket 1-inch wide neck and waist ties, adjustable??neck? ?strap Measures 22'w x 24'l No Teflon finish on Washed Denim.